(Ibn Hossny [®] x Itaba Walide [m-phf]- Ansata Ibn Halima®) straight Egyptian. Sire's sire, Hossny® by US Nat'l Top Ten *Ansata Ibn Halima, out of Sanaaa. Sire's dam has lines to Nazeer, Gamil III, Mashhour. Dam has lines to Nazeer, Fabah, Fay-el-Dine, Ibn Rabdan. Multiple CHAMPION. MEPSA Champion 2008/09. Sire of Mutarahm Amir, o/b PHF. (Shaikh al Badi® x Ansata Sabhiya [bso-lod]-Ansata Ibn Sudan®) Straight Egyptian. Sired by Shaikh al Badi, who was the preeminent son of *Morafic, and was named U.S. Res. Nat'l Champion Futurity Colt. Shaikh al Badi sired National winners, including Ruminaja Ali, US Res. Nat'l Champion Stallion. Ruminaja Ali, in turn, sired Nat'l Champion Stallion Ali Jamaal. This is a strong sire line. Dam by Nat'l Res. Ch Stallion, out of granddaughter of Nat'l TT Stal. Ansata Ibn Halima. Live show placed and photo show winner! IPABRA National Top Ten 2001, MEPSA qualified 2002. Multiple Champion, Reserve Champion, Reserve Grand Champion. Sire of Nile Cloud, IPABRA Year-End Top Ten, and Ibn Sanaan, IPABRA Year-End Top Ten, both o/b PHF; WA Sanaana, o/b Karen Hesse; Al-Maisan, o/b Chris Wallbruch and Mustanafa, o/b Randa Garrett. (Serr Rou [live] x PrincetonMaaroufa [live]- Serr Maariner) Straight Egyptian. 100% Babson lines. Linebred *Fadl. Maternal sire was a famed Dressage horse. Hartland Regal 2001 release OF. Sire of Shesh'Ta, o/b Carra Reinmiller. (Tammen [l] x Qastal [live]-*Soufian) straight Egyptian. Tammen is a Multiple Champion & regional Top 5 in Halter and Costume, and a multiple Champion Country EP horse, with lines to Sameh, Alaa el Din, Talal and *Morafic. Qastal's sire is by Alaa el Din, out of Moniet el Nefous, by Shahloul and her dam is by *Sakr, out of an Anter mare. Suitable for crossing to all the new Egyptian lines, and should produce horses capable of both halter and performance, with moderate English action, and possible speed. Breyer SR JAH SM OF. Sire of Cal'mah, o/b Carra Reinmiller and Champion Waf'a el Moniet, 01, o/b PHF. Fahm Hajar Harik "Coal Fire"
(Bahiim Zuhrah [m-phf] x Kayyir Bint Mokhtar [m-phf]- Mokhtar) straight Egyptian. Sire and dam both on this listing. Sire and dam are not heavily Nazeer bred. Anter, Sid Abouhom, El Sareei, Shahloul, Galal. Peter Stone Arabian OF 'Priority One' RR. Color winner, well placed other classes, IPABRA 2001 National Top Ten, MEPSA 2008 qualified. Sire of Enduring Dark, o/b Laura Rushing. (Qabas [m-phf] x Taira [l]- Soufian) Sire is son of a Nat'l Champion Stallion and Nat'l Champion English Pleasure Horse and out of a daughter of 3x US Nat'l Res. Ch. Park horse and 3x US Nat'l Champ Costume horse, Sakr. *Sakr was also a Halter Champion and Most Classic winner. Sire Double *Sultann bred. Dam has lines to Alaa el Din, Moniet el Nefous, *Ibn Hafiza and Anter, with only 1 line to Nazeer, and two to Mansour on her 5 gen pedigree. Good cross for heavy Nazeer mares. 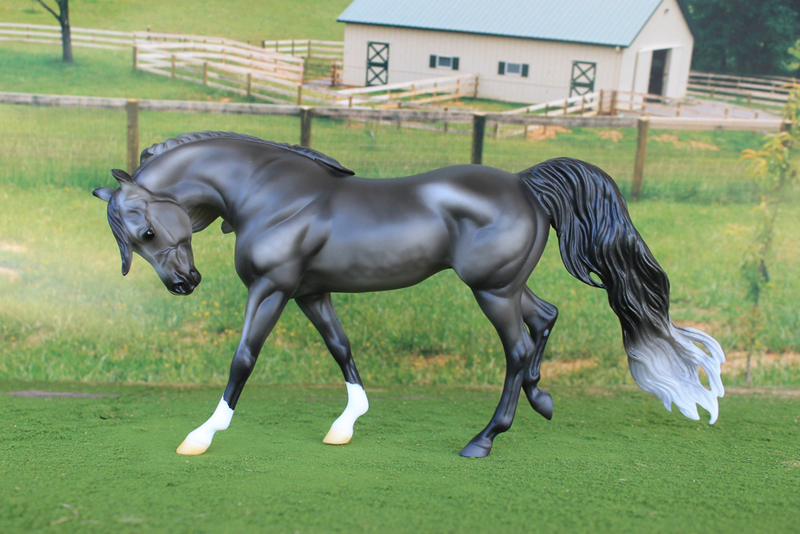 Animal Artistry mini striking Arabian. (Sanaan [m-phf] x Nile Moon [m-phf]- El Hilal) Straight Egyptian. Dam is a Bloodstock multiple Champion daughter of the broodmare sire supreme, El Hilal. Sire is from the most winning straight Egyptian sire line. Stone direct SR Arabian 'Cameo' by Sheri Rhodes. Breed Champion, Color winner, IPABRA 2001 National Top Ten, 2002 MEPSA qualified. (Sanaan [m-phf] x PHF Nile Moon [m-phf]-Imperial Al Kamar [l]) Straight Egyptian, sire is by Shaikh al Badi, dam is out of a *Morafic mare. Both also carry lines to Ansata Ibn Halima. 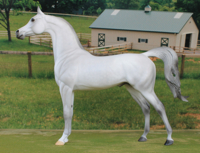 Stone Arabian SR 'Silver Sultan' for H & H Winner's Circle. 2001 IPABRA National Top Ten winner, MEPSA qualified for 07/08. (Mufktahir Amir [m-phf] x Nile Mist [m-phf]- Imperial Imdal®) Straight Egyptian. resin 'Aashiq' by Dara West. Multiple CHAMPION. MEPSA qualified 2008 Halter and Headstudy. (LL Ib Kumar [l] x Bint al Nil [m-phf]- Imperial Al Kamar [l]) Sire is 3/4 Babson Egyptian, 1/4 "new" Egyptian, with his sire line through *Ansata Ibn Halima. LL Ib Kumar is black. Dam is by straight Egyptian Imperial Al Kamar by El Hilal. Kamar has been a good sire. (SW Hallany Shai® x Ravenwood Cassara®- RG Al Mone) straight Egyptian. Simeon Shai, Abenhetep, Alicibiades, Ibn Moniet el Nefous, Julyan. (Negatraz [®] x Prima VF [®] - Bandos) Pure Polish. Perhaps the best *Bask son x crossed on a Bandos mare with excellent lines. Double Bandola, double Negatiw, Salon through Namiet. (Piaff® x Czandora [m-phf]- Aladorr [m-phf]) pure Polish. From a 4 generation line of Polish Nat'l or Res. Nat'l CH stallions. Sire, Piaff, is a Polish Nat'l Champion, and also a sire of a US Nat'l CH working cowhorse. Lines to Penitent, Negatiw, Palas, Amurath-Sahib, No *Bask lines. (*Muscat® x Pristiara [m-phf]- Pesniar®) by the late, great Muscat, US Nat'l Champion stallion, Canadian Nat'l Champion stallion and Scottsdale Champion stallion. Out of a Persimmon Hill mare, by US Nat'l Top Ten Pesniar. Lines to Salon, Arax, Aswan, Priboj, Naseem, Mammona, Taktika. (Garza de Nilo [m-phf] x Orquidea [m-phf]- *Zaon [live]) Straight Spanish. Sire is an MIJC Champion; this is his replacement son. Sire's sire has thrown Champion Halter horses and Nat'l Top Tens in WP, Sidesaddle, HP as well as the 1997 US Nat'l Champion Show Hack horse (of 49 entries), Venus del Nilo. Hoffman China copy of PAS. (Dakir el Khala [m-phf] x Mockingbird CF [m-phf]- Lysander®) 100% Davenport. Sire of Glacier Rose, o/b Martha Baker. 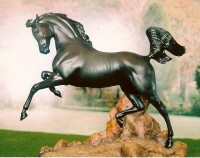 'Amankhar' resin by Judy Renee Pope, OF for H and H model sales. Multiple Champion. Multiple MEPSA Champion. Winner in costume. 2007 OFHC Hall Of Fame, mandatory retirement from club showing. International Champion and Reserve MEPSA 2009 Championships in breed, color, make and gender, Top Ten (3rd) in breed. Sire of Strike A Pose, 08 part Arabian, o/b PHF and MMR Golden Star. 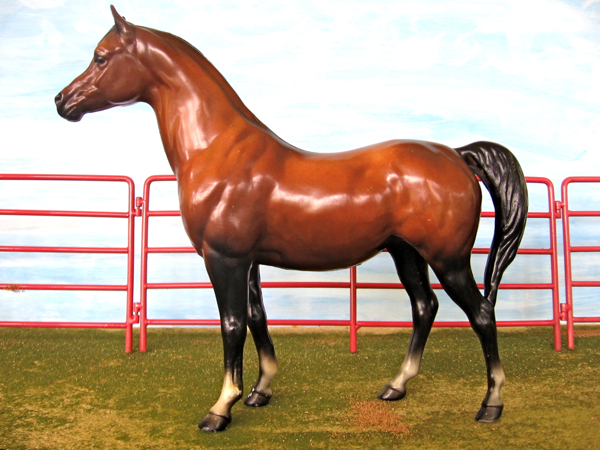 (MHR Muscateal+ ® x Serafine Fire [1988- bso] Serrific+/® x Fire Fancy®- Fire Bolt) Sire is a US Nat'l Champion Reining horse. Great performance horse lines to *Muscat, *Bask, *Serafix, Hanad, Raffles, Kahar, Mirage. Active and athletic! MEPSA Champion in Gender, Color, Breed. OFCC Champion Stallion, Breed (of 80) and Color (of 79) winner. MEPSA qualified 2012/13. (Darq Moon Bey [m-phf] x Blue Bayou [m-phf]- Ibn Ozem PhD [m-phf]) Lines to Champions Huckleberry Bey, Raffon, Ozem, El Hilal. Herd stallion variation from Color Crazy set. (GS Kochise +++//® x Jamala Magdalena [m-phf]- Ali Jamaal®) Sire is the famous Khemosabi+++s most decorated son, having won a Legion of Supreme Merit, 38 National Awards, 5 National Championships, 7 Res. National Championships, 26 National Top Tens, 70+ Regional Awards. Dam is a PHF broodmare by the renowned US Nat'l CH stallion, Ali Jamaal and out of a Nabiel sired mare, with lines also back to Kellogg and Babson horses, like GS Khochise+++//. (Parys el Jamaal® x Autumn Swan [m-phf]- Autumn Seance®) Sire is one of the best producing Ali Jamaal sons, with lines to *Bask and Gai Parada. Dam is a Gai Parada great granddaughter, with lines to *Bask, Crabbet horses, and Egyptians El Hilal and Ibn Hafiza. Dam of TFs Serr Raider, 99, o/b Linda Ransom. Dam of Autumn Moon, 01, o/b PHF.